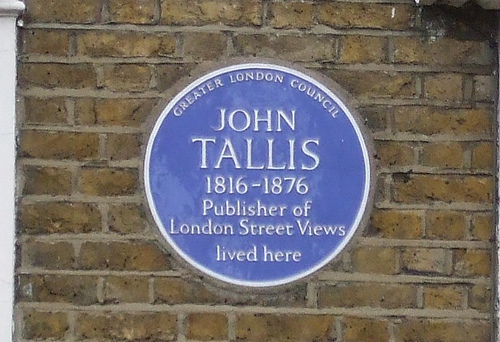 Although Tallis has 120 written above the building on the right in the elevation, the street directory clearly numbers it as 117-119, the premises of Wood and Sharwoods. Number 120 is the house on the left, the private residence of R.M. Wood. 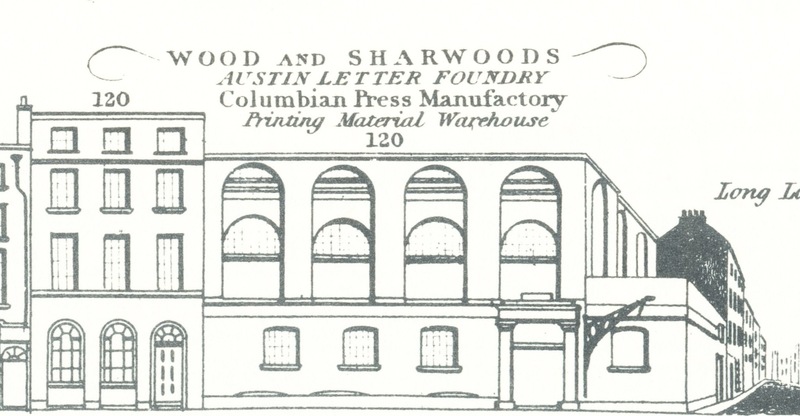 Although Wood and Sharwoods are listed as Printers’ Brokers in the directory and as Columbian Press Manufactury and Printing Material Warehouse in the picture, their business was better known as the Austin Letter Foundry. 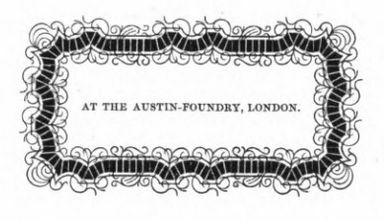 The paragraph above is in short what Talbot Baines Reed wrote about the foundry, but there is more to tell. The building shown in the elevation is non-typical and certainly does not look as if it consisted of existing houses adapted to the business, but much more as if it were purpose-built. 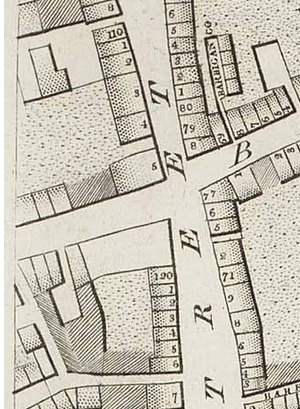 In Horwood’s 1799 map, we can see that the plot has not been shaded in the usual manner, perhaps indicating an empty plot, but when exactly the building that became the foundry was erected is unclear. Richard Mason Wood and the two Sharwoods continued at Aldersgate Street with their type foundry and printers’ material business. 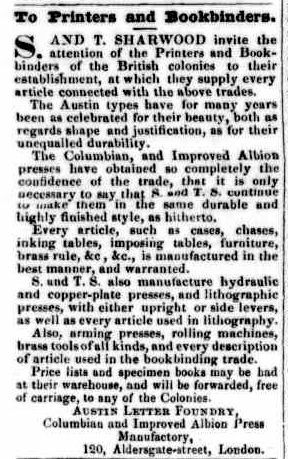 They brought out regular catalogues of the printing material they could supply, not just small items, but also complete Columbian and Albion printing presses. Richard M. Wood died in late 1845 and in his will, he names his former partner John McLachlan, appraiser, still of Chiswell Street, and his present partner Samuel Sharwood, as two of the executors. Wood’s estate is to be sold off and invested for his children until they reach the age of 21. (5) Thomas and Samuel Sharwood continued the business and produced, for instance, the new type specially designed for Lloyd’s Weekly Newspaper. (6) They even advertised their business as far away as in the Tasmanian Launceston Examiner. Unfortunately, Samuel Sharwood died in early 1850 (not in 1856 as Reed would have it), just 39 years old. (7) Thomas died 18 November 1855, 43 years old. 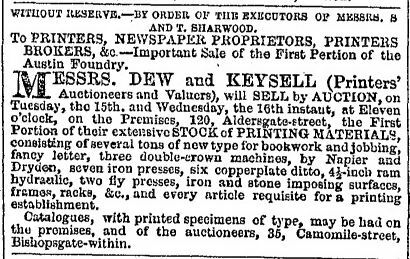 The business was indeed sold off as Reed had said and an advertisement in the Liverpool Mercury of 7 April, 1856, announces that Messrs. Dew and Keysell, auctioneers of Camomile Street were to sell the first portion of the stock of printing material. The premises themselves at 117-119 Aldersgate Street were taken over by printer William Hill Collingridge of the City Press. The sons of Richard Mason Wood: James, Richard Mason junior, Rowland and Austin, all went into the type founding business, forming various partnerships and continuing the name of the Austin Type Foundry, albeit at a different address, but that is another story. 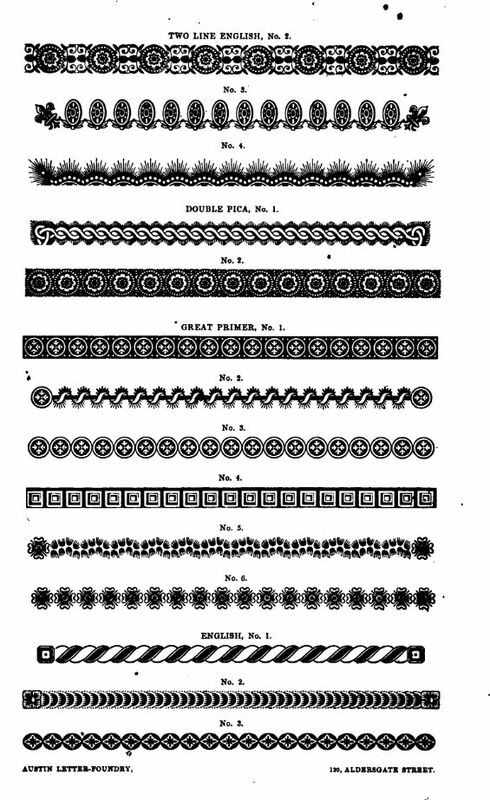 Below some specimen of the type, borders and ornaments supplied by the Austin Letter Foundry, taken from their 1838 catalogue (online here). 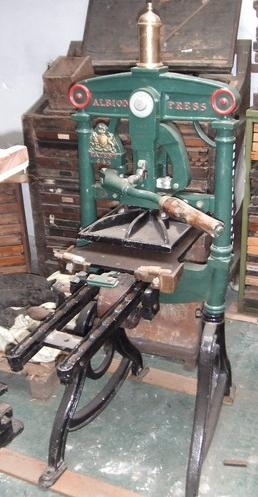 (1) Talbot Baines Reede, A History of the Old English Letter Foundries (1887). (2) The London Gazette, 14 September 1830. (3) Derby Mercury, 11 May 1836. (4) Hull Packet, 7 August 1835. (5) National Archives, PROB 11/2026/95. (6) Announced by Lloyd’s Weekly Newspaper in the issue of 23 January 1848. (7) He was buried in 11 January 1850 at St. Mary’s, Hornsey. (8) Obituary notice in The Gentlemen’s Magazine, 1856 and announcement in The London Gazette, 8 August 1856, asking creditors to state their claim on the estate. Hi, James mason wood was my great great grandfather, I understand that his son James wood also had a press manufacturing business at the Barbican. Have you any info on him. 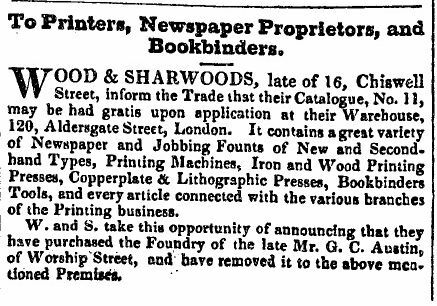 The 1861 census gives James Wood as a typefounder, so certainly in the printing business and a notice in the London Gazette of 4 March 1862 lists the dissolving of a partnership between brothers James Wood, Richard Mason Wood and Rowland Wood as typefounders and printer’s brokers at 89 West Smithfield, so certainly close to the Barbican. James and Richard Mason are to continue the business. By 1869, these two dissolve the remaining partnership (London Gazette 3 Sept 1869). They are then working from Farringdon Road. 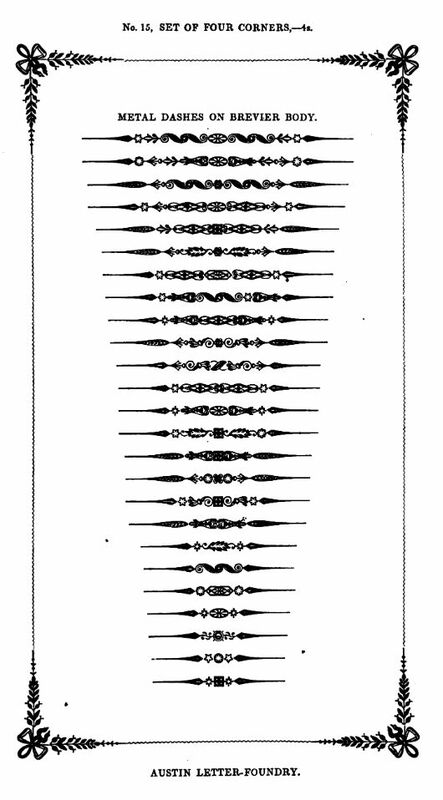 James was still listed as a typefounder in the 1871 census. Thank you for that information, that is really useful and helps me in my research.